Welcome to the final 2012 regular season edition of Someone Still Loves You Alberto Riveron’s weekly NFL power rankings. 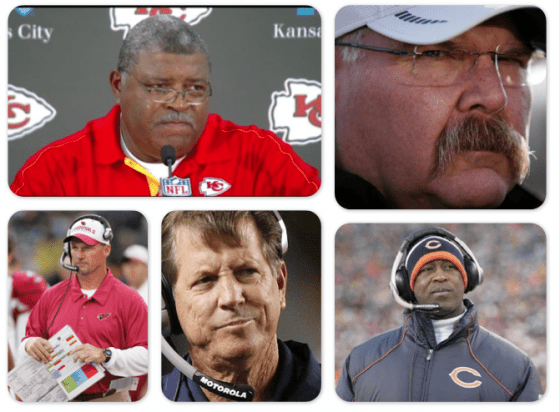 To help us make sense of what happened during this last batch of NFL action, we’ve asked the seven coaches who were fired yesterday to share their thoughts with us below. Please enjoy. Scene: A Ramada Inn Conference Room in Boise, Idaho. Seven disheveled coaches slowly take their seats around a beautiful, elongated oak table. One man stands in front of a projector screen, fiddling nervously with his glasses, ready to use a PowerPoint presentation if need be. Schottenheimer: *worried expression* Actually, Romeo, buddy, I’m worried you’re not completely grasping the weight of the situation here. What actually happened to you and the other six guys seated around this table was you got fired and are no longer the head coach of your football team. Don’t worry, my friend, I’ve been there before – I was fired four times myself – and I know how to get you through it. Crennel: *confused* So when I go back to work when this retreat is over with, there will be another gentleman sitting in my office? Well, I suppose I can make some room easily enough – Bill Belichick had four people to an office back in the dynasty days, after all. Saved on electricity, he said. Schottenheimer: *runs hand through hair, shakes head* You know what, we’ll come back to you and get you all straightened out before this is all over, but I’d like to go ahead and get started if I could. Now, all of you will no doubt be going through the different stages of grief over the coming days and weeks, perhaps even months. Obviously some of you …glances at Romeo…are still in denial right now; on the other hand, many of you probably flew right past that and over to anger. Maybe you’ve even gone through the bargaining stage and are now head-long in depression. My job today is to get you all all the way through to the final stage: acceptance. Andy, which stage would you consider yourself to be in right now? Schottenheimer: *grasps Andy’s hand firmly, nods sympathetically* I understand, Andy. We all need a break after a certain period of time. Lovie, tell us your thoughts about being fired. Remember, be open and honest. Uninhibited communication is the gateway to all personal healing! Lovie Smith: *stares straight ahead, nods periodically* We’re in the third quarter of the fourth quarter of the first quarter of the fourth quarter of the fourth quarter of our season. We like our team. Jay is our quarterback. We got a lot of football left to play. Schottenheimer: *shakes head sadly* You can talk to me, Lovie. I’m not the media! Tell me what’s really going on in your head – your hopes, your dreams…even your fears. I want to get to know the REAL you! Schottenheimer: Okay, okay, Lovie, I’m just going to stop you there. Thanks for sharing that with us today. …muttering to himself…Maybe not a whole lot more going on in there…to the whole group…Now for four of you, this is the first time you’ve been fired from your head coaching position – the pinnacle of your profession. The job you’ve spend thousands upon thousands of hours working to secure – and then in one fell swoop, it’s all taken from you like *snaps fingers* that. How do you recover from such a great loss to your personal livelihood? Luckily for all of you, we’ve got a grizzled veteran of these wars in our midst who, I’m sure, has some great wisdom to share with all of us. Chan, what did you learn from your previous terminations that helped you better prepare for this one? Chan Gailey: *strokes beard with lean, hungry look in his eye* Uh…dunno. Mainly, you learn to stock up on canned goods and industrial-size boxes of whole grain cereal, I suppose. All non-perishable food items that won’t go bad quick, really. Gotta make sure, ultimately, that you have some deep reserves for the lean times ahead. You never know if you’ll get another shot at a job or house again. Schottenheimer: *worried look* I’m sorry, Chan, are you saying that when you lost your job, you also lost your house? Are you living on the streets right now? Gailey: *strokes beard with lean, hungry look in his eye* Sure. Isn’t everybody else here, too? Norv Turner: *shakes head angrily, pounds fist on table* NO! I can’t go back! I can’t go back to being an offensive coordinator anymore. I just can’t! Do you know how much it killed me to take order from Mike Nolan in 2006? MIKE NOLAN!!! All this fake smiling and kissing up to people and “Oh no, Coach Wannstedt, starting Jay Fiedler doesn’t sound like a terrible idea at all.” GAHHHH I’LL COACH IN THE UFL BEFORE I GO BACK TO OC-ING. Schottenheimer: Look, let me stop you two right there. I wanted this to be a positive, uplifting seminar that made all of you feel good about being position coaches again, but this pity party I’m suddenly attending leaves me no choice but to take the gloves off. Norv, you’re an offensive mastermind but you have no sense of clock management, your teams continually underperform expectations, and you have a losing career record despite three different teams SOMEHOW believing you could turn them around. You’ve had your chance. And, Ken…I mean, you thought starting Derek Anderson was a good idea. I really don’t think I need to say more than that. Whisenhunt: You don’t understand, in practice he was only overthrowing Larry by five yards! Schottenheimer: *blank expression* I’m sorry, who let the hotel concierge into the room? I assure you, sir, we will graciously tip you at the end of the seminar. Now does anyone have something they want to say before we go on a muffin break? Turner: Somebody out there is going to want a thrice-fired head coach who couldn’t lead the most talented team of the last half-decade to a single Super Bowl, right? PLEASE SAY THERE WILL BE. Smith: *stares straight ahead, nods periodically* We’re in the fourth quarter of the fourth quarter of the fourth quarter of the fourth quarter of the fourth quarter of our season. We like our team. Caleb Hanie is our quarterback. We got a lot of football left to play. Whisenhunt: Associate me in your minds with Kurt Warner and not Ryan Lindley! Gailey: *strokes beard with lean, hungry look in his eye* Anybody gonna eat those packs of butter on the table? Crennel: *fiddling around in pants pockets* Wait…uh…well, unfortunately it appears I have locked my car keys in my Chevy Aveo again, does anyone have a shirt hanger or other similarly-curved object that I could use to jimmy my car door open? Shumur: I was an NFL coach, too! Here are the final SSLYAR power rankings of the regular season. First, of course, is Adjusted Yards per Play Differential, which is a descriptive metric that is designed to give an accurate representation of how each team has played thus far. San Francisco fittingly finishes #1 after leading most of the season; the rest of the top five is Seattle, Denver, New England, and Washington. Chicago is the best-rated team to not make the playoffs (mainly due to their outstanding turnover differential), Indianapolis – surprise, surprise – is by far the lowest rated playoff team, coming in at #30. And now the final Predictive Yards per Play Differential rankings of the year. Predictive Yards per Play Differential is a metric which doesn’t give as large a penalty or bonus to turnovers or touchdowns, will also take into account strength of schedule and will (theoretically) better able to predict future performance. This metric uses probabilities drawn from research Brian Burke did back in 2008 in trying to determine which stats best correlated with future play. For example, because offensive performance is much more consistent from week-to-week than defensive performance, offensive play is more highly prioritized in these rankings. San Francisco was #1 for all but two weeks in these rankings and they remain #1 despite the strong late challenge from their NFC West rival, Seattle. There are four teams in the top ten of these rankings that didn’t make the playoffs: Carolina, Detroit, St. Louis, and the New York Giants. And while the Rams look to be in a tough spot with the 49ers and Seahawks stuck in their same division, those three other teams would be pretty decent dark horse candidates to make the playoffs. If you’re into making predictions, that is. After only getting four out of the twelve postseason teams correct this year, I’m not so sure I’m as psyched about it anymore. This Post was posted in Power Rankings and tagged Andy Reid, Chan Gailey, Football, Ken Whisenhunt, Lovie Smith, NFL, nfl power rankings, NFL Week 17, Norv Turner, Pat Shurmur, Romeo Crennel, Sports. Bookmark the permalink.